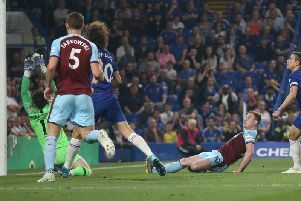 Ashley Barnes described his winner against Crystal Palace as “one of the best” as the striker brought an end to a 21-month spell without a goal. The 27-year-old, who has endured a torrid period on the sidelines, suffering cruciate knee ligament damage and hamstring troubles, awoke from his nightmare when netting in the fourth minute of time added on to put the Clarets in to dreamland at Turf Moor. The former Brighton and Hove Albion forward hadn’t scored since the 2-2 draw with West Brom in the Premier League last February but got back in to the routine at the weekend, thumping Johann Berg Gudmundsson’s cross in to the roof of the net to spark scenes of delirium. Speaking about his journey to get back to match fitness for a second time, Barnes said: “I feel very high. It was a great team performance. “They changed formation and pinned us back a bit in the second half, but Heats has kept us in the game and lucky for me I’ve got the winner. Barnes added: “It was a relief, it was fantastic. Being out all that time, just to score again and see the ball hit the back of the net was lovely. “I’ve been through a lot to get it but I don’t want to preach on the bad things, that’s not me, I want to look forward. The positives of the outcome is today out on the pitch, scoring goals. The finish drew comparisons to the strike against Wigan Athletic on home soil that earned Sean Dyche’s side promotion to the top flight in 2014, with Dean Marney supplying the delivery on that occasion. That came before the initial heartache, inflicted in what was a seemingly innocuous challenge by Fabian Delph at Villa Park, and so, with the added emotion attached, it was understandable to see the celebrations exacerbated. “I’ve stayed positive,” he said. “If you let yourself get down then it’s beaten you. I’ve got a great family around me and a great bunch of lads in the changing room to get me through and it’s helped. Barnes made his comeback in the stalemate against Manchester United at Old Trafford at the end of October and from that moment, he said, he had to try and be the individual who could make the difference. That moment arrived in the 86th minute on Saturday as he replaced record signing Jeff Hendrick with the score locked at 2-2. The hosts had surrendered a two-goal cushion, not for the first time against the Eagles, as Connor Wickham and Christian Benteke cancelled out first half goals from Sam Vokes and Gudmundsson. And he feels that there’s much more to come from him. Scoring goals at this level certainly isn’t an alien concept to Barnes, who scored five times in the previous campaign. Asked if he’ll do it again, he said: “Yeah, definitely. Unfortunately for us we got relegated but I feel like the spirit in this group, and with this group of players, we can stay in the league.